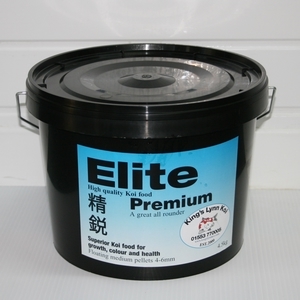 Elite Premium is a very high quality, immune enhancing, food for Koi. We have formulated our food to provide the correct balance of ingredients for Koi. Elite foods are lucky enough to include Kusuri Klay. Exeter University Biology Department, 16 years ago, discovered that the addition of Kusuri Klay removed stress proteins from the digestive tract. Stress proteins come from feeding food that contains airborne spores of Fungi and Algae. This subsequently inhibits the fish’s ability to absorb and digest food efficiently, this can lead to poor growth and health. Kusuri Klay has the effect of cleansing the digestive tract, allowing the high quality ingredients to be absorbed, keeping your fish happy and healthy. Key benefits of Elite Premium include: Garlic to reduce parasitic infestations. Kusuri Klay for better digestion of up to 22% Antartic Krill, Spirulina, Shrimp Meal to improve colour. Basic analysis: Protein 37%, Oil 6%, Fibre 3.2%, Ash 9.7%, Moisture 10%. Small 2-3mm pellet or medium 4-5mm pellet sizes.